What makes BootStrap every developer's best friend? Is it the ready-made blocks of CSS and HTML codes? exhaustive documentation? or responsive design? It's all the 3 plus many more elements that make BootStrap a boon for developers. But if you've never built a Bootstrap theme, you are probably not sure where to start"! But don't you worry, we've just the thing for you". It's not a "How to- guide" that will help you in building the framework. Instead, it's a solid introduction to Bootstrap covering all the necessary information to get you started with Bootstrap. This wonderful resource is 197 pages of Bootstrap in Practice can lend a hand in planning your first website design project. 197 pages PDF ebook that covers all the necessary information to learn Bootstrap from a beginner's perspective. Original Themestrap themes you can use for refreshing the default look and feel of Bootstrap. The Bootstrap in Practice eBook is 197 pages of solid examples. It's a perfect beginner's book to introduce you to the world of Bootstrap and show you how to successfully profit from your designs. While the actual Bootstrap framework documentation can walk you through all the necessary steps of using the code, Bootstrap in Practice is the perfect primer to get you ready to learn. 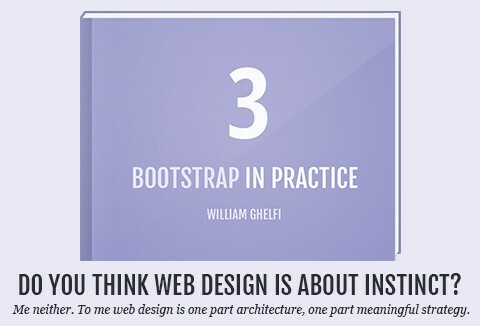 You'll dive right into building your very first page using Bootstrap 3. Master the basics, including the powerful grid system. Plenty of direct instructions and loads of examples will help move you along. Once you've mastered the basics, the second half of this helpful eBook focuses on practical uses for Bootstrap. Learn how to create a powerful landing page and an elegant blog post. You'll even be taught about CRUDL (CReate Update Delete List), the archetype for every Web application out there. In addition to Bootstrap fundamentals and real-world applications, Bootstrap in Practice also features a number of interviews with industry champs focusing on the current and future outlook of the Web. Interview subjects include Michael Bleigh (CEO of Divshot), Brad Frost (Future-Friendly and This is Responsive), Mark Otto (Bootstrap creator), Thomas H. Park (Bootswatch creator), and Justin Dorfman (BootstrapCDN by MaxCDN). William Ghelfi is a former poet and musician turned web developer, turned teacher, turned web designer. Being all of this earned him the position of R&D Director at Entando - the startup that's simplifying Enterprise Portals. He lives in Cagliari, Italy. You will get instant digital download after your purchases. One copy for single user. You cannot resell this package.